Students have three hours of science per week in Key Stage 3 at Upper Wharfedale School. They then have the opportunity to take separate science, Biology, Chemistry and Physics at Key Stage 4 or study the Combined science course which gains the student two GCSE’s combining all three sciences. Throughout their time at school in science we aim to encourage practical participation in lessons and a help foster an inquisitive mind. This topic focuses on techniques used in science and develops an understanding of safety in the science labs. This topic focuses on techniques used in all three disciplines of science. The topic uses a crime scene to have a practical experience of all three science. It also helps develop team work, communication, presentation and written skills. This topic focuses on chemistry biology and physics skills to help explain how and why adaptation happens and why. This topic focuses on what the universe is made from, develops an understanding of day/night, years, phases of the moon. A true Physics topic. This topic focuses on the human body and how it functions it is a follow on from Human. This topic is a traditional chemist topic with a focus on what substances are made from, what reactions are and how we know. This is a very practical topic. This topic focuses on rock cycles and volcanoes. This topic focuses on the development of how the body functions. This topic focuses on electric circuits and how they function another highly practical topic. 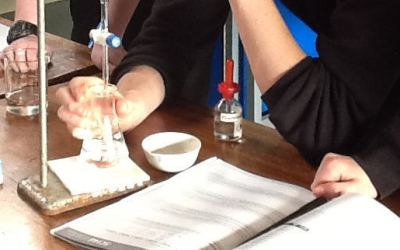 This topic focuses on developing the understanding of chemical reactions with many practicals. This topic focuses on the fundamentals of different waves, what they are how they behave and how we use them. This topic focuses on genes, genetics, evolution and extinction. This topic focuses on how reactants react what the products are and the calculations. This is a practical topic also bringing maths into chemistry. This topic focuses on renewable and non-renewable energies, how they are produced and the advantages and disadvantage of each. Energy transfer and efficiencies. Towards the end of Y9 the GCSE topics are started(see below). Science matters. That’s why we’ve chosen the most inclusive GCSE (9–1) courses, so every student can enjoy science and succeed in their studies. Students will either study Combined science with 22 core practicals across Biology, Chemistry and Physics that are designed to help bring science learning to life. They will then sit 2 exams in Biology, Chemistry and Physics to gain two qualifications. Students who choose to study the separate science will study Biology, Chemistry and Physics to achieve a GCSE in each subject their course will include 24 core practicals across Biology, Chemistry and Physics that are designed to help bring science learning to life. They will then sit 2 exams in Biology, Chemistry and Physics. The content for the separate science is all of the Combined science with extensions in certain topics(see below). KS3: Each unit is assessed at the end with a written assessment that all student receive feedback on. KS4: All exam based for all qualifications. A mixture of different question styles, including multiple-choice questions, short answer questions, calculations and extended open-response questions. Calculators may be used in the examination. KS3: Students receive regular homework tasks in Y7 based on the lessons being taught however in Y8 and Y9 Homework projects are used to help foster the enthusiasm of budding scientists. KS4: Students have weekly homework from science, homework is in a variety of different styles with exam questions being a focus either on paper or on the virtual Activelearn website. Science is heavily involved with the F1 in school projects that goes on most lunchtimes. There are also intervention and drop-in sessions to assist students.